[NOTE] The system of Snowflakes will be arranged according to the situation/purpose of a concert/exhibition. The computer died. Or at least, desktop-style and laptop-style computing died. As we find it difficult to believe that pioneers used a room-size mainframe, programmed in machine code and created the music so slowly outside of realtime (thank you! Max Mathews, etc), someday we will wonder that composers and performers ever used desktop or laptop computers. In 1999, I accomplished the “incubator” project. In this work, 50 iMacs (with CRT displays!) 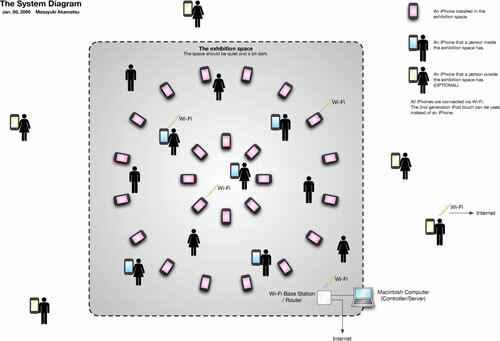 were placed on the floor of the venue to form a grid, and connected using the Ethernet to form a local area network. The iMacs’ built-in microphones were used as input and the built-in display and built-in stereo speakers were used as output. In total, this system had 50 audio inputs, 50 video outputs and 100 audio outputs. Since the iMac was equipped with a CPU, each of them could process anything and communicate with each other through the Ethernet. One of the main aims of “incubator” was to compose network-based music and present it as a real formation with audible and visible presence. Most computer music at the time promoted a centralization of power, assuming a single musician, such as an isolated composer, a virtuoso performer or an orchestra conductor. Thus I wanted to investigate the possibilities of a new musical form with an autonomous distributed processing system and interaction with the audience. Today, nearly 10 years since “incubator”, the computer is evolving and appears on the palm of my hand. It’s not called a computer but is presented as an iPhone, a mobile phone. So I’m producing “incubator”-like networked music pieces with iPhones. The first one is named “Snowflakes” and will be performed with Mr. Fredrik Olofsson and Mr. Itaru Yasuda, in Ogaki (Japan) in September 2008, and in Shanghai (China) in October 2008. “Snowflakes”, compared to “incubator”, simply replaces iMacs with iPhones and changes from Ethernet to Wi-Fi. However, a big difference between them is that the audience with the iPhone can participate, move and leave freely. In addition, I don’t provide iPhones but exploit iPhones in the pockets of the audience. In other words, “Snowflakes” is a flexible open system even though “incubator” was a fixed closed system. What will happen in this new system? Is music changed by the form of computer or network? The difference from iMac to iPhone is clear, and the difference will affect the music, or at least that’s my opinion. Please remember how music changed when the PA system and the recording system appeared. Eventually, ring-like or necklace-like wearable computers will appear, and then a computer will be implanted and blended into our body. I wish to plan works assuming such a world. Don’t use old computers anymore. [NOTE] This article was originally for “Contemporary Music Review”, 2009.